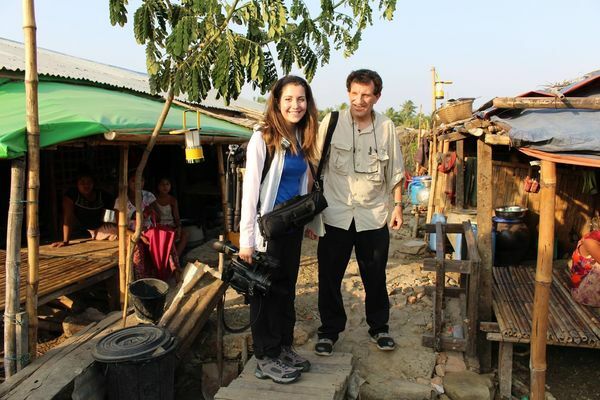 Senior Nicole Sganga spent part of summer 2014 traveling in Myanmar and reporting with New York Times journalist Nicholas Kristof after winning the “Win a Trip with Nick” contest. While in Myanmar, she wrote and filmed her way through encounters with Rohingya Muslims living under protracted persecution in internment camps. What you might not know is what Sganga learned—and where she hopes her adventures as a global citizen will take her next. A Hesburgh-Yusko scholar double majoring in film, television, and theater and political science, Sganga has seen a great deal of this one world. 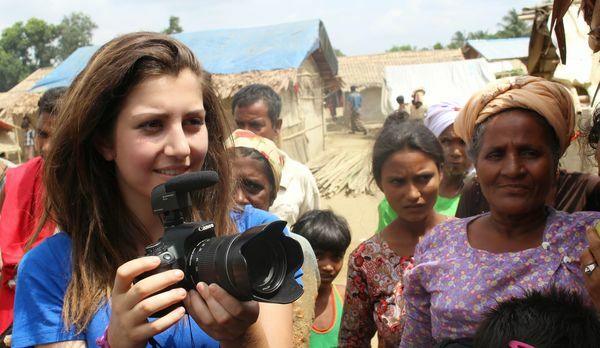 Even before she went to Myanmar with Kristof, she had leveraged her Notre Dame preparation to gain international internships at the Cannes Film Festival, the CBS News bureau in London, and in Thailand with the nonprofit HELP International. Sganga, who comes from a family of physicians and health care professionals, admitted with a smile that her own mother worries about her career path as a journalist. Whereas Khin’s mother discourages her daughter’s medical ambitions knowing they will lead to disappointment, Sganga’s mother would prefer medical ambitions to the dangers that follow globetrotting storytellers. In addition to these personal contrast experiences, Sganga found herself faced with ethical questions: whether to give a child $10 because she had it and giving it could help him stay in school; whether it’s exploitative to grab a small slice of someone’s life and broadcast it to the world; how to stay compassionate and sane in the face of stark human suffering. Sganga—who has donated her hair four times to Locks of Love—brims with compassion. Even the research projects she undertook while studying in Washington, D.C., and London were internationally focused and socially concerned. In D.C., Sganga studied the influence of American and international media rhetoric during the 2011 Libya uprising; during a Study Abroad semester in London, she conducted research on Palestinian refugees under a professor at London School of Economics. Asked what she plans to do after graduation, Sganga explained that while the translators she and Kristof traveled with were fantastic, serious work in international journalism requires knowledge of language. Already enrolled in Arabic courses at Notre Dame, she wants to become fluent and is considering graduate school in Lebanon, Egypt, or Oman. Originally published by Amanda Skofstad at international.nd.edu on November 13, 2014.